How Do I set alarms on my Samsung Galaxy Tab?A? The Clock app offers features for keeping track of time and setting alarms. 1. From a Home screen, touch Apps > Clock . 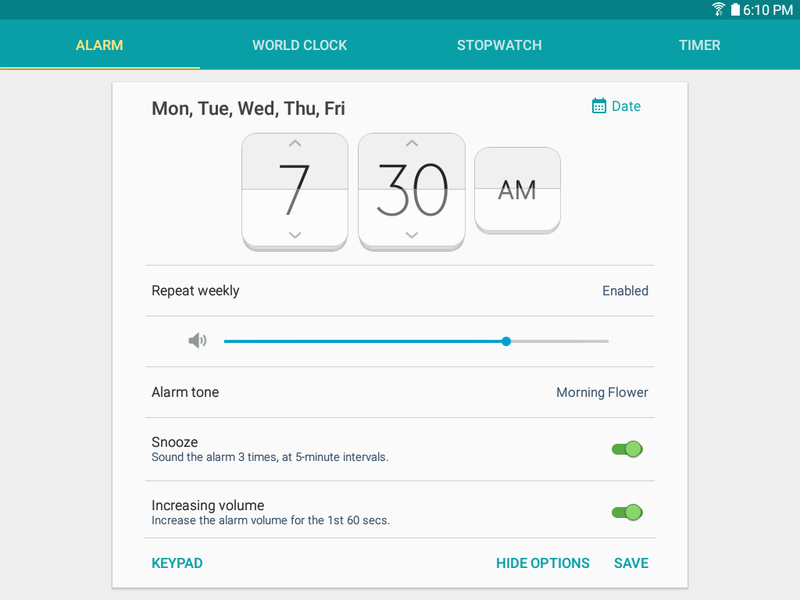 • ALARM: This feature allows you to set an alarm to ring at a specific time. 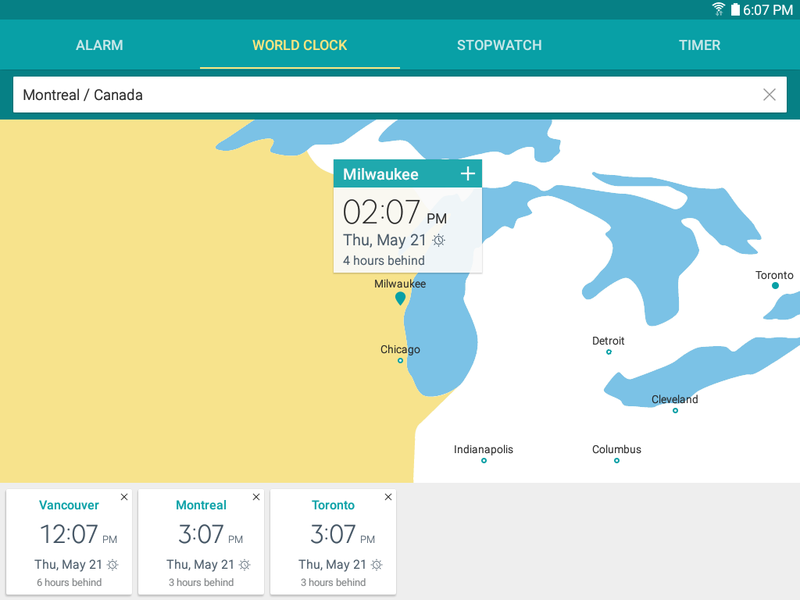 • WORLD CLOCK: View the time of day or night in other parts of the world. World Clock displays time in hundreds of different cities, within all 24 time zones around the world. • STOPWATCH: Measure intervals of time. • TIMER: Use a timer to count down to an event based on a preset time length (hours, minutes, and seconds). Create an alarm event. 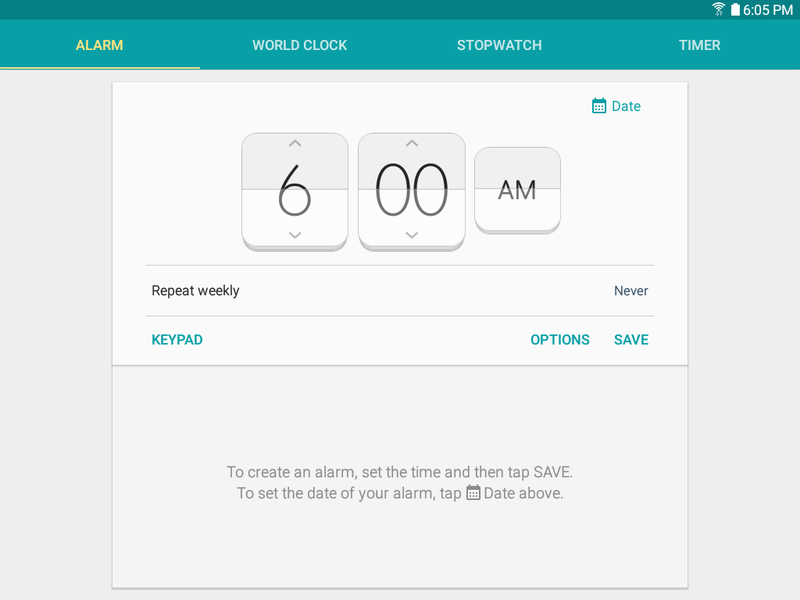 You can set one-time or recurring alarms, and choose options for how to be notified. • Date: Choose the day for this alarm. • Time: Set a time for the alarm. • Repeat: Repeat the alarm every week. • Alarm tone: If you have chosen an alarm type that includes sound, choose a sound to play for the alarm. • Volume: If you have chosen an alarm type that includes sound, drag the slider to set the volume of the alarm. • Snooze: Allow snoozing, and set interval and repeat values for the alarm while snoozing. • Increasing volume: When on, the alarm will start playing a tone at a low volume at an interval before the alarm time, and slowly increase in volume. Available when you have chosen an alarm type that includes sound. • Alarm name: Enter a name for the alarm. 3. Touch SAVE to save the alarm. 2. Find the alarm in the alarm list (under the Alarm tab), and then touch Delete in the upper right corner of the alarm entry.